We all know the importance of healthy food for our kid. Making our children to eat healthy diet makes them healthy and fit. Healthy diet not just includes food intake, it even includes fluid intake. Child love to drink soft drinks, but they are worst choice of drinks to sip. More than 40g of sugar is present in one serving of soft drink. Too much sugar is not good for health. Sugar is one of the main causes of obesity. And obesity is the cause for many dangerous diseases. Water is the best choice for no sugar drink for kids and everyone else to drink. Whereas, milk is one of the best healthy low sugar drinks for kids to have. Fruit juices without added sugar are other best choices to drink. Apple juice is one of the healthiest juices for kids to have. It keeps the kids away from many diseases and also improves immunity power. It is best source of antioxidants, polyphenol, flavonoids, vitamin C, vitamin A, and potassium. Remember that while making apple juice, don’t add sugar and try to pick organic apples. 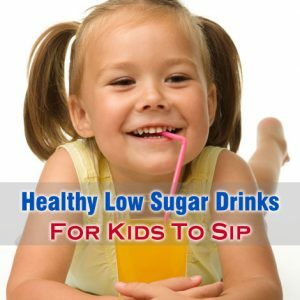 Orange juice without sugar is another best choice for low sugar drinks for kids to sip. 100gms of fresh orange juice contains just 8gms of sugar in it. There are many health benefits of Orange juice that kids can enjoy by sipping it. Coconut water is also one of the healthy drinks for kids can have. Coconut water is low in sugar content. Sugar content is just 2.6ml for 100ml of coconut water. There are many health benefits of coconut water. Coconut water is a good source of vitamins, minerals, and many other nutrients like iron, potassium, sodium, phosphorus, calcium, magnesium, etc. Drinks coconut helps in preventing dehydration, strengthening bones, boosting energy, improves digestion, etc. Soy milk is another benefit drink with low sugar content in it. Soy milk contains 4.1gms of sugar in 100ml. This can be great choice for children with lactose intolerance. Soy milk is a good source of calcium, vitamin A, vitamin B12, and vitamin D.